As a side step to the extension distribution discussion I would like to show off my implementation efforts for the Roon Extension Manager. Since a picture is worth a thousand words, I created a video that demonstrates some of the actions (the quality isn’t great but the idea should be clear). Discussions about layering, OS specific optimizations and inclusion in endpoints and servers can be found in the earlier mentioned thread, feel free to join the discussion. If you are an extension developer and you want your extensions included in the repository you can give me a pull request on it or send me a PM with the GitHub link of your extension. Extensions should have a matching support thread on this forum. Although development is still in the beta phase, this release is pretty feature complete. So if you are a developer or have used other extensions before, you maybe should give this a try. The repository can still do with more extensions, so developers please apply. 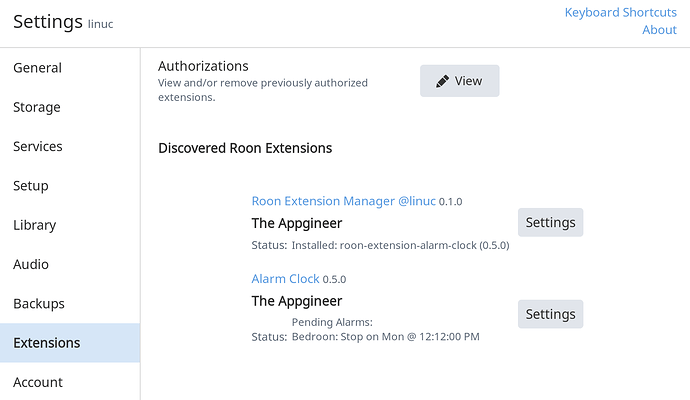 Roon Extension for managing Roon Extensions. Contribute to TheAppgineer/roon-extension-manager development by creating an account on GitHub. The GitHub page has instructions on how to install the extension. Using this extension requires some tinkering (as the forum category suggests), I tried to make the installation instructions as clear as possible but things can be slightly different depending on the OS you’re using. I wouldn’t have reached this point in development without the feedback I already got. By entering this next phase I hope to get feedback from others as well. So let me know your ideas about this! Hey @Jan_Koudijs – quick update: just installed without any hiccups. I’ll be following this with great interest. Once again your efforts are much appreciated. I doze off with a slowly fading Alarm Clock setting every night. Second @RBM no issues here. Will keep a good eye out. 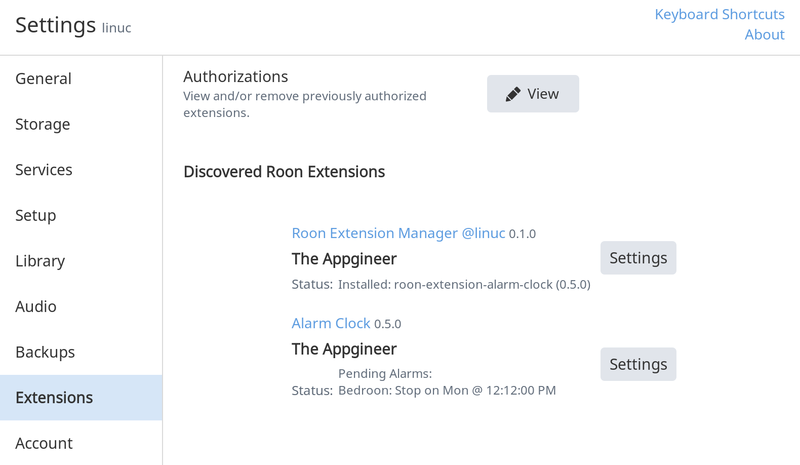 An update of the Roon Extension Manager is now available!! Implemented Auto Update. The installed extensions, the repository and the manager itself are updated at the configured time. Auto Update can be disabled by clearing the time field. It is always possible to update individual extensions via the ‘Actions’ pull down menu. Implemented Auto Restart. When the extension manager restarts after an update the controlled extensions that were running previously are also restarted. Implemented watchdog. In case the communication with the Roon Core gets lost after a core update or a network issue, the watchdog takes care that the extensions recover from this situation. Read the first post for detailed information and installation instructions. The update of the Roon Web Controller provided by @Mike_Plugge gave me a good opportunity to test the update function of the extension manager in a real life situation. I performed the update via the Actions pull down menu within the manager settings. The update went fine and when at completion the extension restarted, it identified itself as version 1.2.0. The only additional action I had to take is to re-authorize the web controller due to the additional Roon APIs that it now uses. That is great news @Jan_Koudijs! yeah I’d seen the extension manager. I’m of the opinion that if someone can install your manager, they can install an extension. That’s not to undermine it, I just think it will be limited in its impact on the wider non-technical audience, for which it has to be as simple and intuitive as clicking in the Roon UI. Until then all this great work will only reach a handful of people which is a great shame. All IMO. The idea behind this is more than just the extension manager. The extension manager is the first step that bundles multiple extensions in a single entry point. This should make it easier to come up with installers for the different platforms that Roon supports. This step can then be followed by getting it preinstalled on different Roon servers and endpoints. The current release of the extension manager already takes care that execution is moved to the background and that the console output with the pinging messages gets hidden. All to move complexity away from the user. How successful this all will be has to be seen. It will depend on if I am able to attract other developers and what the Roon team has in mind for this. I have an installation issue and, unfortunately, my knowledge of the relevant packages is very rudimentary. However, no extensions are shown at this time under Settings->Extensions on my Roon interface. When you say “your Roon remote” do you mean the normal Roon Windows interface or something else? Have you installed on Windows? I noticed that on Windows the lib/ part is indeed missing. I just released an update to solve a few Windows issues. You may have performed your installation while this work was in progress. Can you repeat the installation and see if that makes a difference? The output of this should give us more info. Ps. I’m working on a Windows installer that installs the extension as a service, this may be of interest to you (probably requires some bug hunting as well). Yes, my Roon server is running under Windows 10. I tried installing a fresh copy of yourcode from github and then running “node start.js”. The result was the same as before: no extensions visible from within the Roon interface. Then I tried to run “node start.js inherit” but the output from this program did not provide any more debugging info. As you can see at the bottom of this message, the two node commands produced the same info. OK, looks like the start script doesn’t work on Windows. This way the auto update doesn’t work, so you have to disable that by clearing the update time field in the settings. Yes: “node .” did the trick. Roon can now see your extension manager, and I was able to install the alarm clock. As you suggested, I cleared the update time field. I noticed that the bash window remain active and I suppose this is normal. Also, I suppose that whenever I restart my computer, I will need to restart your code manually until you can turn this into a Windows service. I have a first test version of the Windows installer and the only way I can test this myself is in a VM running Windows XP (I’m a Linux guy). Are you willing to test the installer on Windows 10 and give me some feedback on the results? Just let me know if you want the 32 or 64 bit version and I’ll sent you a PM. Sure, I will b happy to test your 64-bit version (though I epect to be very busy over the next 2-3 days). I’m a Happy user of these two Roon extentions. And My Roon core is on a SonicTransporter, so I use a PC for my Extentions. As well as HQPlayer which also starts automatically from a reboot. Can anyone guide me how I can make these extentions automatically start and run in W10 ? Of cause to add the cmd to startup is fairly simple and guides are easily found on the net. The tric is how to automatically add/paste the required text into the different command windows. @agillis what you think ? Just the piece of SW needed ? I second that motion! Adding this to ST would be great. I’ve been looking on in envy as running a PC 24/7 for this is not practical for me, although I have tested the alarm and got it working ok. Thanks for this, I like the smoother and cleaner install experience in this version.